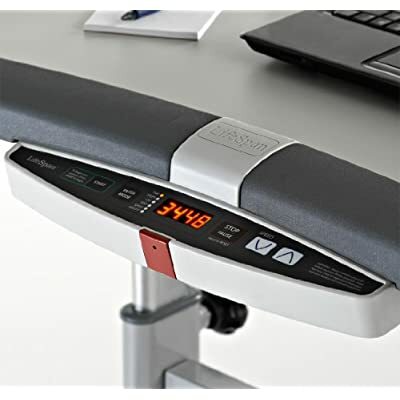 The LifeSpan treadmill desk seems to have found a nice niche in the increasingly popular world of treadmill desks. Steelcase is the Cadillac of the industry with their Walkstation treadmill desk. Unfortunately it comes with a Cadillac price as well ($4,399). 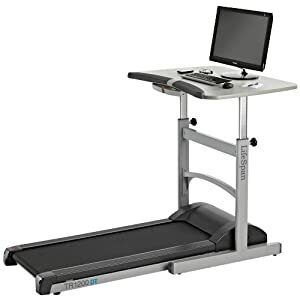 At the other end of the market is the TrekDesk, which is only $589, but it doesn’t come with a treadmill (it’s designed to straddle most treadmills). The thinking is that you can buy your own inexpensive treadmill and save money. Now there’s an option for someone who wants the convenience of an integrated treadmill desk, without paying almost $5,000 to Steelcase. The LifeSpan treadmill desk retails for $1,999, but you can find it on Amazon for $1,299. This treadmill desk has a nice control panel for adjusting the treadmill while at your desk (which is nice; it can be tough to reach the control on a standard treadmill when you have a laptop in front of you.) It also has specifically designed trays for holding your computer cables. If you haven’t tried a treadmill desk, you’re in for a pleasant surprise. If you keep the speed slow (about 1 MPH) you can easily work on your computer, read, use the phone and do just about any normal office activity. And at that speed, you don’t sweat and you don’t need any special shoes or gear. It’s like getting free exercise while you work. For me, it feels like I’m more focused and can concentrate better when using one. And since you burn 100 calories per hour walking at this pace, it will help your waistline too! We are getting ready to film some side-by-side running videos of the Vibrams Fivefingers “shoes.” They are very low tech, but they are a useful piece of health tech if you’re looking for a way to develop a more natural running form. More on that later. To get the right perspective for the video shoot, we needed an easy way to capture video from ground level. We think we’ve found a simple solution: the Glif from StudioNeat. Using this simple bracket for the iPhone 4s, we can easily use the phone to capture some ground level footage. 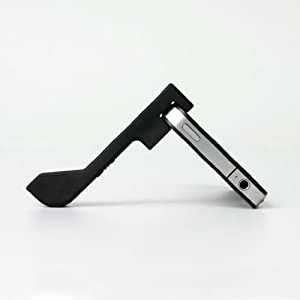 This is a well-designed piece of hardware that securely hooks your iPhone up to a tripod. Plus it works as a simple stand for watching videos or doing FaceTime on the iPhone. 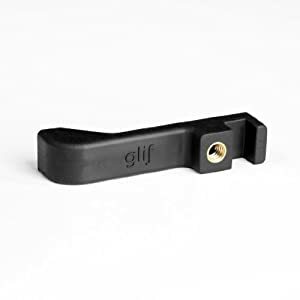 They also have a bundle that includes couple of add-ons that secure the Glif for angled (or even upside down) video shoots. One of the most common places where health and tech meet up is at the gym. Or the bike path. Or for me, the running trail. So we always try out the latest cases and screen protectors for our phones (which are usually working triple duty and serving as our music player and our GPS tracker). 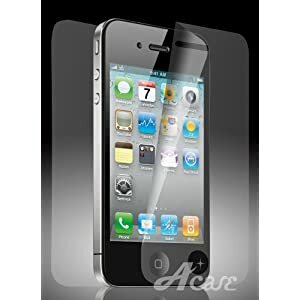 To that end, we are currently testing the Acase screen protector for the iPhone 4 and 4s. With some of the screen protectors tested in the past, we’ve encountered issues with bubbling and rainbow colors when viewed from an angle. The best protectors are the ones are so unobtrusive that you don’t even notice they’re on your phone. In once case the film protector on an old iPhone 3G saved the phone from falling apart after a fall to the sidewalk during a run. The screen cracked (it landed on the corner), but the shatter was small and stayed confined to one area. The phone kept working and the touch screen seemed unaffected. Stay tuned for more about how the Acase holds up in testing. 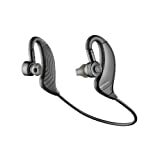 Best Bluetooth headphones for exercising? We are about to do a test of the Plantronics BackBeat 903+ Headset. A lot of people are looking for the best way to cut the cord to their headphones when working out. I can’t even count the number of times I’ve knocked my headphones off while trying to look graceful getting off the treadmill…not a pretty sight! After trying the Jawbone ICON HD (which works great for regular phone calls) on several runs and bike rides, I was pleased with the cordless experience, but let down by the low fidelity music listening experience. It’s OK for listening to podcasts, but not great for music. That brings us to stereo Bluetooth headphones like the BackBeat 903+. With stereo speakers, on-device buttons for controlling volume and skipping tracks, and tighter integration with smart phones like the iPhone, this should be a great way to cover the miles of my morning run with a smile on my face. Stay tuned for the full review! I’ve been testing a Striiv fitness pedometer for the past couple of months. As mentioned in my Striiv First Look review from back in November, the Striiv is one of the new crop of fitness gadgets that try to make it more fun to add more activity into your daily routine. Many have asked why I don’t just track my exercise using one of the free (or cheap) activity trackers available for smart phones like the iPhone or any of the Android phones. The difference is ha avior change smart pedometer like the Striiv is on all the time, unlike an app on your iPhone that is only running for short periods of time (most pedometer or GPS apps running on a phone will wear your battery down too rapidly to use them all day). This is a big difference. It lets you track all the little things you do throughout the day, so you can try to get to a typical goal of 10,000 steps in a day. And once you see your daily step count (and if you’re like most people, you’ll find it’s lower than you think), you’re more likely to walk a bit more. I find myself looking down at my Striiv when I’m on the go and will often take the longer route to squeeze in some “free exercise.” That’s healthy behavior change in action! If you are a more advanced fitness enthusiast, I would recommend a smaller, and more technical device like the FitBit Ultra, or perhaps the soon-to-be-re-released UP Band from Jawbone. The Striiv is $99 at Amazon. Here’s an overview video from Striiv that shows the device in action. Last month we talked about the new Jawbone UP Band entering the market for wearable fitness gadgets. In a surprise move, Jawbone has just announced that it has stopped selling the Up Band and is offering refunds to current customers while they work things out. Here is the letter from Jawbone describing what happened. Add some sort of small display (like the FitBit) for instant feedback right on the device. Seeing how your doing in real-time can help motivate you to change your behavior. Earlier this year, we unveiled Jawbone’s vision to help people live a healthier life with UP. We’ve been thrilled by the passionate response to this product. We heard from tens of thousands of you through emails, tweets, blog posts and on our forums about how you’re changing your lifestyle and becoming consumers of your own health. In just four weeks, UP users have collectively taken over three billion steps, gotten more than 300 years of sleep and captured hundreds of thousands of meals. While many of you continue to enjoy the UP experience, we know that some of you have experienced issues with your UP band. Given our commitment to delivering the highest quality products, this is unacceptable and you have our deepest apologies. We’ve been working around the clock to identify the root causes and we’d like to thank everyone who has provided us with information and returned their bands to us for troubleshooting. With your help, we’ve found an issue with two specific capacitors in the power system that affects the ability to hold a charge in some of our bands. We’re also fixing an issue with syncing related to the band hardware. Typically, these issues surface within the first seven to ten days of use. The glitches are purely performance related and do not pose any safety risk. We’ve also received helpful feedback on the application experience, including bug reports, ways to make signup and finding friends easier, user interface suggestions and new feature requests. Your comments are invaluable as we continue to improve, so please keep them coming and check back frequently for updates to ensure you’re always enjoying the latest features and enhancements. This means that for whatever reason, or no reason at all, you can receive a full refund for UP. This is true even if you decide to keep your UP band. We are so committed to this product that we’re offering you the option of using it for free. The program starts December 9th and full details can be found at http://jawbone.com/uprefund. For most of you, this program is simply meant to offer peace of mind. Please continue to enjoy your UP band and keep sharing your experience with us. If you encounter any problems with your UP band, contact Jawbone directly for your choice of a replacement and/or refund under this program. It’s that simple. Jawbone remains deeply committed to addressing all issues with UP, investing in the category and giving our customers the tools to live a healthier life. We’ve temporarily paused production of UP bands and will begin taking new orders once these issues have been sorted out. In the meantime, we’ll continue to release app updates for existing users. We regret any disappointment we’ve created for our community of users and appreciate the trust you’ve put in us. The fact that you’ve taken the time to talk with us and help us make a better product is simply phenomenal. Our customers have always been part of our team and we’re incredibly grateful for that. Please know that we’re doing – and will continue to do – everything we can to make things right. This is just the beginning for UP and we are excited to keep improving until we realize the powerful vision of what this category can be. If there is absolutely anything else we can do for you, please let us know. Over the years, we have slowly engineered activity out of our daily routines. Many of us sit in front of computers all day at work, and then continue the sitting into the evening in front of the television. Kids are no different. They are sitting desks at school (where physical education has been eliminated in many cases) and then they come home and play video games or watch TV. Technology, which is often the reason that kids are sitting around, can be used to actually get them moving! Take a look at this simple idea for getting kids (and adults!) to be more active while watching TV. The concept is simple: stop pedaling and the TV stops. Start pedaling again and the TV starts back up. The product is called 123GoTV. There is a new contender in the increasingly crowded “smart pedometer” field. This one is called Striiv. Unlike the clip-on FitBit Ultra or the Jawbone UP Band for your wrist, the Striiv looks more a key chain. A key differentiator (no pun intended) is the big color display. The FitBit Ultra has a nice display, but it’s one color. And the UP Band has no display. Why is the display important? Since the point of a smart pedometer like this is to get you to change your behavior (such as walking more) the display is key because it gives you instant feedback. Which makes you look at it more often. Which might lead to more activity. On the downside, the key chain form factor might be less convenient than the click-and-go FitBit Ultra or the Jawbone UP Band (which can be worn like a watch that you never take off). Look for a full review and head-to-head comparison soon. The latest iPhone from Apple has a little-discussed capability called “Bluetooth Smart Ready”. This is a new 4.0 version of the Bluetooth short range wireless technology that is designed for low power devices. (If you’ve ever used a wireless mouse and keyboard, or a wireless cell phone headset you’ve probably been using Bluetooth.) A Bluetooth Smart Ready device like the iPhone 4S can then communicate with this new generation of Bluetooth Smart devices that can run on tiny button-cell batteries and were created to collect only a specific piece of information. We should be seeing a slew of new devices like heart rate monitors and pedometers using this new technology to wirelessly communicate with our smartphones in the coming months. 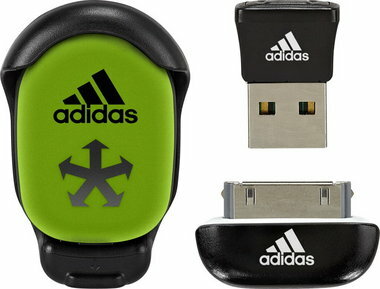 Adidas is launching a new way to track your athletic exploits. Similar to the FitBit and the Nike+ personal fitness trackers, the new MiCoach SPEED_CELL will launch on December 1st 2011 for about $70. The key differentiator for the SPEED_CELL will be that it tracks performance in all directions. So if you jump to clear a hurdle or dunk a basketball, the device will track all your forward–and vertical–progress. Unfortunately the SPEED_CELL must sit inside a specially designed cavity in the outsole of Adidas footwear, so it’s not as simple as clipping it onto your belt, like you can with the FitBit. And in the case of Nike+, you can even use their mobile phone app and just use your phone for tracking. The SPEED_CELL should have a more complete picture of your workout, so there are trade offs to be made. Once t he SPEED_CELL is released we’ll do a head-to-head comparison with the FitBit and Nike+.